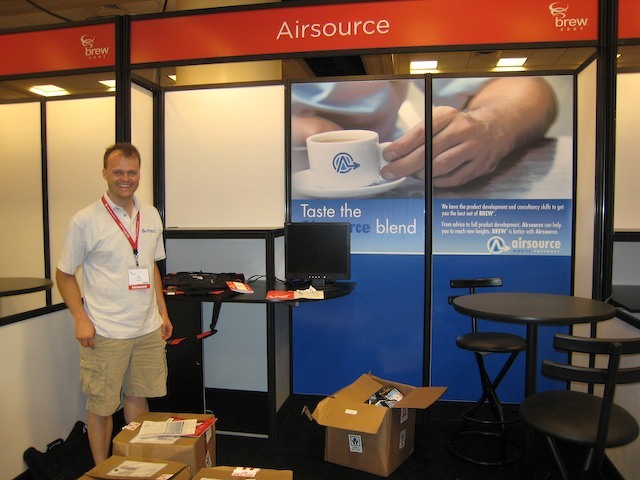 The Airsource team are now back in the UK after BREW 2007. We've had a good post-conference debrief, which was particularly interesting for me, the CTO of Airsource, as it was my first BREW conference. I have a few thoughts I'd like to share. We found the conference invaluable for meeting new contacts, both leads and possible partners, and our stand definitely enabled us to meet leads who we wouldn't otherwise have spoken to. As a relative newcomer, we met a lot of people who I suspect we would not have encountered had we not had a stand - and if we can convert any of these into sales, then it will definitely have been worth it. What I'm less certain about is the technical talk we gave. We're still eagerly awaiting the speaker evaluations, though the initial feedback we've had is good, and we're hopeful that we gave a good impression of Airsource. However, there are two doubts in my mind about the talk. Firstly, I'm far from convinced that a single 50 minute talk is the best way to educate an audience of people on a technical level. Presumably our audience were primarily embedded software engineers, and my experience of that community is that they like to read, and are perhaps not so adept at listening. I read (and write) a lot of technical articles, and in retrospect I think that the time we spent constructing, practising, and delivery our talk, might have been better spent on writing a set of good articles to be digested at leisure by the technical community, to be followed up by an in-person Q&A session. I had some quality one-to-one discussions with QUALCOMM engineers while at the conference, with output which was far more valuable and interesting than any talk could possible be. Secondly, and more seriously from a business perspective, the talk we gave took at least two man-weeks to prepare (I'll have to check our timesheets for precise figures when I get back to the office), and that's a considerable investment for a small company. We need to be certain, if we are to repeat this exercise next year, that it will reap benefits. I'm not convinced. It may improve our standing in the developer community. It may, just possibly, improve our Google ranking. It certainly helped my personal development in a number of ways. But will it lead to cash on the table? I'm dubious. If we can help the BREW community while growing our business, then we will certainly do so, but to spend two man-weeks a year on essentially pro-bono activity is simply not going to be sustainable for us. One approach might be for us to give a more business-related, less technical talk next year. However, feedback has been that there isn't really much truly advanced programming matter in the technical tracks. The BREW community seems to want more developer information, not less. We certainly do... Part of the problem, perhaps, is that the compensation for speaking is a free conference ticket - which is not exactly compensation for the time and investment in creating a worthwhile talk. I'm aware that a number of BREW developers who weren't previously aware of our blog will now be reading it, and I'd very much appreciate any feedback about what you felt about the talks this year. Do you feel that the talks need to be more technical? Did you speak, and if so, do you think it will help your business? Either email us, or post a comment here on the blog. We look forward to hearing from you!